The Designs team deliver gifts and donations to The Preston Road Women’s Centre. Signage and vehicle branding company Designs’ latest campaign has proved to be a huge success, after collecting hundreds of donations from Hull residents. After calling out for the public’s support as part of the company’s ‘It’s a Wrap’ campaign, Designs attracted city-wide attention, with video coverage of the donations reaching over 13,931 people across social media. 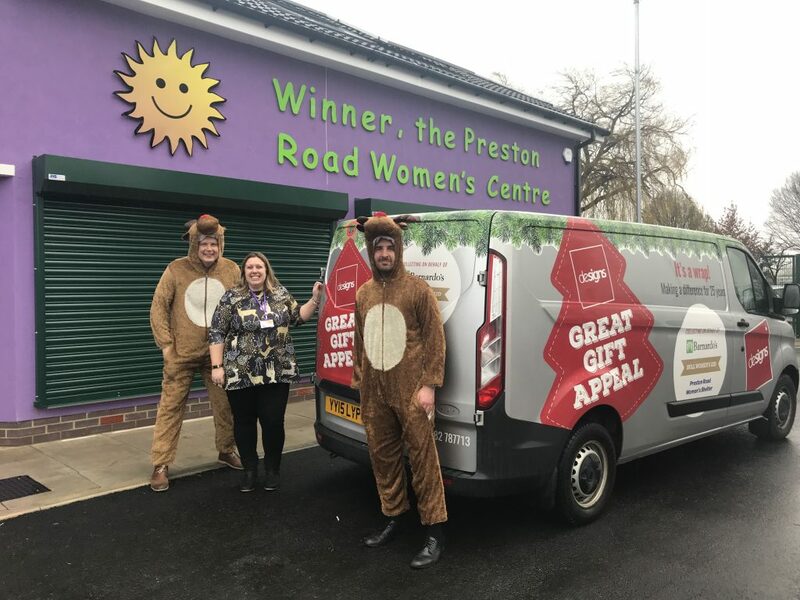 The campaign called on the people of Hull to donate any additional gifts or essential items to drop-off points across the city, which were then delivered to three charities in a bespoke Santa’s Grotto on wheels, which Designs created by specially wrapping one of their own vehicles. The gifts were then donated to local organisations Barnardo’s, Hull Women’s Aid and the Preston Road Women’s Centre. Both managing director Rob Daysley and the team at Designs have thanked local residents for coming together to help families in need over the festive period who, without the support of the community, may not have received any gifts at all on Christmas Day. The three charities have also reached out to thank the public. Following the campaign, an ongoing partnership has been forged between Designs and the three local charities, with further activity being organised throughout 2019 to help some of the most vulnerable residents in Hull. As one of the UK’s leading signage and vehicle branding companies, Designs work across a wide range of sectors, with major clients including Premier League and European football clubs. As experts in wrapping, the business employs more than 35 people, and work on projects in industries including retail, education, commercial and property development. Be the first to comment on "Designs thank the community for helping others over Christmas time"